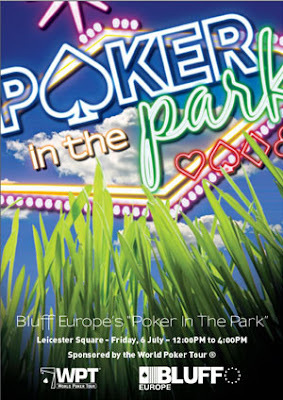 Bluff Europe has declared “London is now the number one poker destination outside of Las Vegas!” (Bluff Europe, July 2007) Together with World Poker Tour, they're putting on Poker in the Park, a huge outdoor poker party in central London on July 6th. Says Bluff: From the stylish casinos of Mayfair to the home games of Hackney, Londoners are flopping the nuts, missing their straights and sucking out big time. Haven’t a clue what they're talking about? Get to Leicester Square from 12:00 PM to 4:00 PM on Friday July 6th for a spot of ‘Poker in the Park’ to get the low down on the poker craze that’s sweeping the city. This is one of those times that I wish I could be in two places at once! I'll still be in Las Vegas recovering from the PlayersOnly.com WSOP party but if you're in London July 6th -- get down to Leicester Square!! !